Congratulations to our students who were recognised for their achievements at our Principal’s Personal Best assembly today. Principal’s Personal Best: Oliver; Music award: Sarah; Weekly Merits: Max and Demaris; Totally Incredible Citizen (TICS): Adrian. Well done to these students! As the grey clouds zoomed across the sky, the Zone Cross Country carnival commenced! First there was the 8/9 girls event followed by the boys. After that there was the 10 years girl and boy race. The 11 year boys (which consisted of most of the Tighes Hill team) zoomed past the finish line. The 11 year girls had a wonderful race and scored lots of points. The 12/13 boys and girls were last for the day and also performed exceptionally well. Everyone behaved very well, the weather held off throughout the events and everyone was really tired by the end. The day’s final score was; Kids:1, Storm:0. Well done and thank you to Nelson for offering to report on this event for our blog and taking some fantastic photos! Today the OC received a visit from our Mathematicians in Schools (MiS) partner, Dr Jarad Martin. 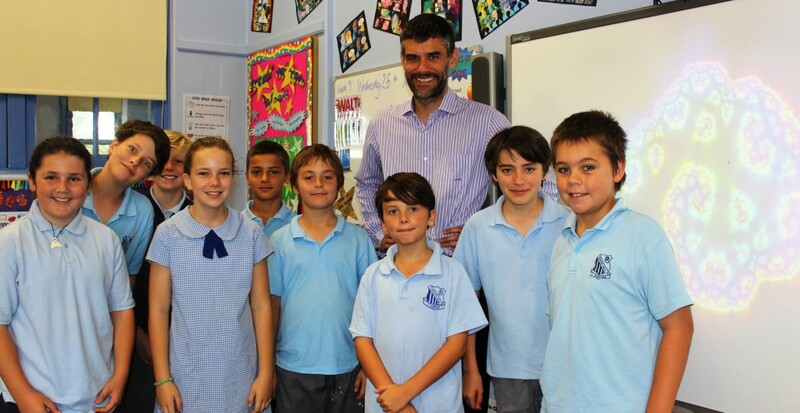 Dr Jarad, who works at the Calvary Mater Hospital, has been involved in the MiS program for several years and volunteers his time to share his enthusiasm and expertise in mathematics with our students. During today’s session, students learnt about Isaac Newton and Einstein and their importance in the history of science and mathematics. Dr Jarad also shared an interesting story about the mathematician who solved the Poincare Conjecture and we looked at fractional dimensions and examples of fractals in nature. A huge thank you to Dr Jarad for visiting us today. We look forward to seeing him again next term. Well done to the students who completed the Rainforest Diorama Super Task. Students presented their wonderful creations to the class this week and explained the designing and constructing process involved with this task. These dioramas are currently on display in the upper hall. 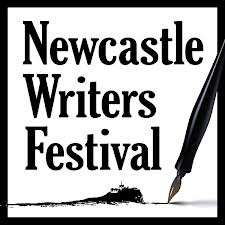 In Week 10, the OC will be attending the Newcastle Writers Festival to participate in a Gifted and Talented writers workshop with author Gerry Bobsien. Students will have the opportunity to purchase Gerry’s books and get them signed on the day. Other books will also be available for purchase at the Newcastle Region Library during the festival kids program. There is a Family Fun Day on Saturday 5th April until 1pm for those that are interested. Attached below is the permission note, book purchasing form and a link to Gerry’s website. 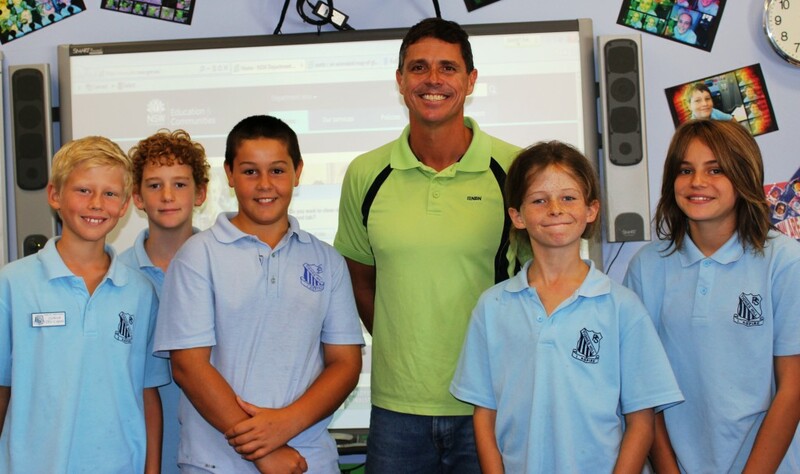 Today we received a special visit from NBN’s weatherman Gavin Morris. A weather enthusiast, Gavin taught us all about forecasting and interpreting a synoptic chart. We learnt about different pressure systems, the atmosphere and watched an amazing time-lapse video of a weather satellite orbiting the earth. We really appreciate Gavin taking the time to visit us today. Be sure to watch NBN tonight from 6.50pm to catch a glimpse of a photo of Gavin and our students. 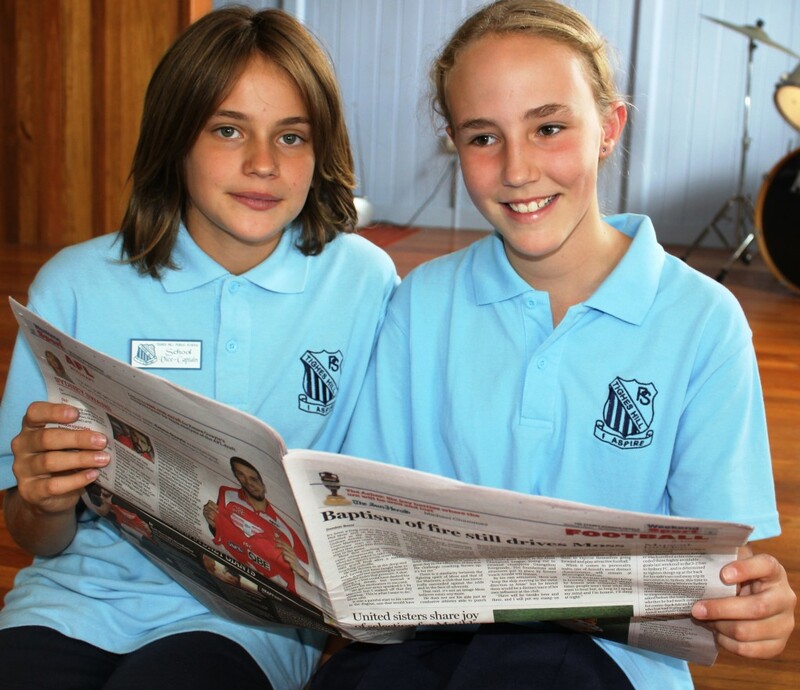 The OC is once again taking part in the Newcastle Herald Writing Competition. 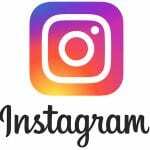 We are looking for great local community stories to write about. If you’re interested in helping us out, please let us know. Our newspaper will be published next term on the 20th May. Last Friday our Year 6 students attended an excursion to Waratah Technology Campus to participate in taster lessons in preparation for high school next year. Students were treated to a variety of fun and hands-on lessons including cooking, woodwork, science and art. They had a great day and were very impressed by the selection of activities and resources. Thank you to Mrs Ireland, who accompanied our students on this terrific event. 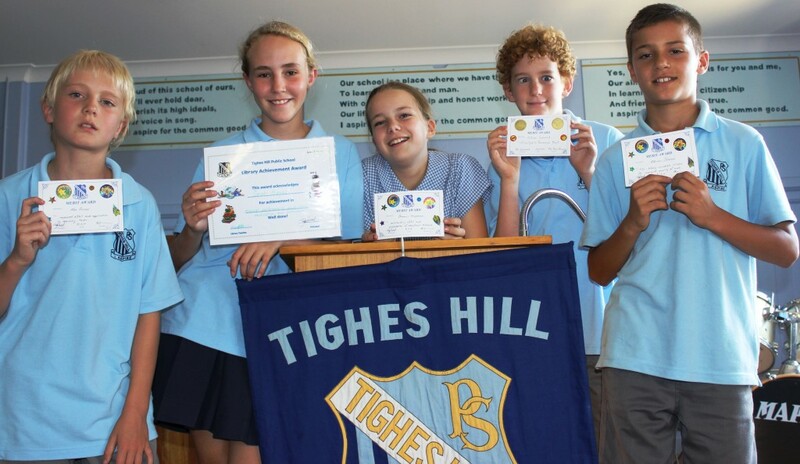 Last week notes were sent home with our Year 6 students about ordering 2014 Graduation shirts. The note is attached below and orders need to be in by Friday 26th March. I will be receiving some sample shirts in the coming weeks for students who would like to try them on to help with sizing. 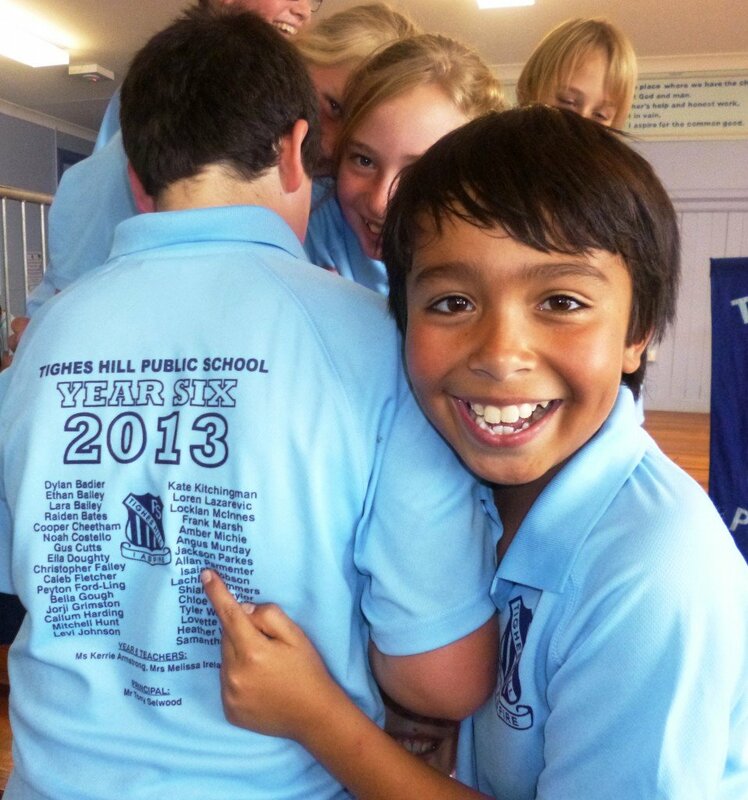 Year 6 2013 showing off their new shirts!